Massachusetts pipeline safety regulators issued around $275,000 in Dig Safe fines last week, with 79 excavators facing civil penalties. At the top of the list was K. Daponte Construction Corp. of Fall River, with eight Dig Safe violations in Cambridge, Somerville, Marion, New Bedford, and Watertown from 2015 and 2016. With its penalties at $5,000 a pop, the firm was ordered to pay $40,000. Other repeat offenders were the Greener Group, LLC, of Lowell, with four admitted violations; FED Corporation of Dedham, with four; and Barletta Engineering of Canton, with three admitted violations. In Western Massachusetts, NPL Construction Co. “failed to employ reasonable precautions to avoid damage to underground facilities” when excavating near 134-138 Prospect St. in Springfield around July 6, 2016, and was fined $5,000 for the single violation. 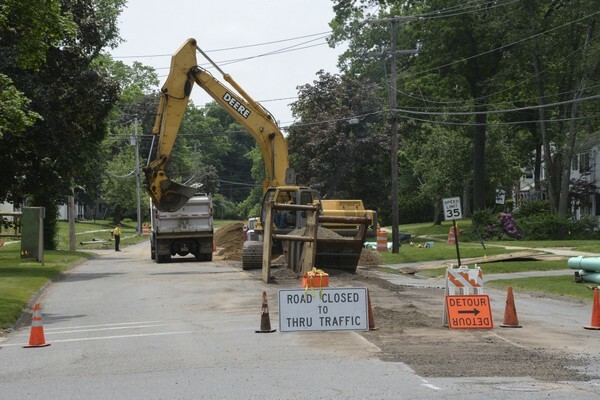 In Chicopee, F&J Construction of Ludlow admitted to causing damage to underground facilities on Grattan Street and Mary Street in 2015, and must pay $10,000. Other local firms must pay $1,000 fines for first-time or less-serious violations. In Massachusetts, Dig Safe rules are enforced by the state’s Pipeline Engineering and Safety Division. The division did not return a call Monday seeking more information about its Western Massachusetts remedial orders. The Dig Safe law was enacted to ensure public safety and protect property when excavation is planned near underground utilities. It requires pre-marking the location with symbols and colors, providing 72 hours notice, and digging with “non-mechanical means” near pipelines, telecom cables, buried power lines, and the like. Contractors are told to “call 811” before starting a project. The Sept. 13 “comprehensive disposition” from the Department of Public Utilities bundled 100 cases. The violators had either received notices of probable violation, or received informal review decisions, and failed to respond as required. The failures constituted an admission to alleged facts, and authorized the DPU to issue its final remedial orders. The orders may be appealed to the Massachusetts Supreme Judicial Court. The documents may be viewed on the DPU website under docket number 18-70.